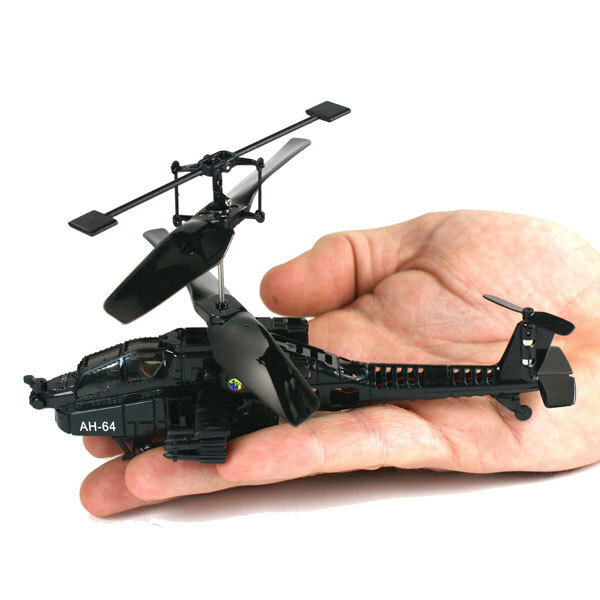 Designed for indoor flight, this new and intricate 3 channel Remote Controlled Mini Apache Attack Helicopter has more controlled flight than ever before! With its super light frame, cutting edge micro-motor and dual-rotor system for extra stability, this Mini Helicopter comes ready to fly straight out of the box. Complete with a wide-ranging tri-band infrared control system (A, B, C), fly with your mates without interference from other channels! Fly up, down, left, right and even forward and backwards! Charging takes place via the wireless infrared transmitter and a 20 minute re-charge is equal to 8-10 minutes flight time! Control distance approximately 10 metres. Recommended for ages 8+ due to small parts. Requires 6 x AA batteries for transmitter (not included).